Since transitioning from Nordic ski racing to triathlon, I’ve found that my off-season has gotten increasingly shorter. These days my triathlon race schedule spans from the end of March to the end of October — a long season, in my opinion. Fortunately, when my season ended last October in Maui, I didn’t find myself at all plagued by the burnout that can often accompany a long, full season of racing. I was still loving every minute of competing and training, and I was honestly craving just a little bit more (which may have been in part due to the fact that my knee injury had me sitting out a decent chunk of the early season). I felt really blessed to finish on a high note, feeling good both mentally and physically, and was happy to be left wanting more. But, as always, I knew I had to embrace the off-season. Even as someone who really loves racing, and — like anyone — loves being in top form, I am learning more and more the value and importance of taking time to let the body come back down and relax. This is surprisingly difficult for many athletes to do even after a hard year, I guess because it’s just so counter-intuitive to everything we’re accustomed to. As “type-A” as most of us triathletes are, allowing ourselves to fall out of shape can be a little stressful. It’s hard not to feel like you’re going backwards… but you have to learn to let it go, embrace the rest, trust in the process and have faith that your body will get back to where it should be in due time, once it’s allowed the time it needs to recharge and rebuild. Finding some solid outside distractions is always a big help! Personally, I like to approach the off-season as my chance to ‘catch up’ on the many other aspects of my life that can end up compromised during race season when I am so hyper-focused on racing, training, recovery, staying healthy, and other elite-athlete-type things. So, while they’re unfortunately two of my busiest months of the year in terms of work, without the extra stress of racing and heavy training, November and December gave me a chance to catch up with friends and family over the holidays; watch movies, and even start a new book; do some more writing; cook, bake — and eat! — all kinds of delicious foods; host dinner parties; go out and enjoy more than one glass of wine without worrying about the repercussions; do only what I felt like in terms of physical activity — consequently taking a good hiatus from swimming and starting Nordic skiing again; enjoy long chats over cups of chai; and just soak in all the awesomeness of life. I can’t say I didn’t miss triathlon a little bit during this time, but with so many other things going on, there was plenty to focus on. Levi working on his relaxation. Having some fun on the frozen, snowless lakes! Love catching up with friends over the holidays! One thing I particularly loved about the holiday season this winter was all the inspiration I found among the friends I got the chance to catch up with. While many of their lives are very different from mine, I find myself so inspired by all of the amazing things they are doing, and still so connected with them in that, like me, they are pursuing their passions, and investing themselves just the same way I do in achieving their goals — whatever they may be. From a friend making a big move to take an opportunity in his field of physical therapy to work with some of the world’s very best athletes; to another who is thriving and shining in a major management position at one of the coolest new companies in existence; to friends who were courageous and driven enough to give up jobs, homes and comfort to go back to school in pursuit of a bigger dream and very admirable master’s degrees; to friends who left solid positions that they didn’t love to do seemingly “crazy” things like become a fitness/nutrition consultant or a fly fishing guide… these dear friends of mine are making bold and brave decisions to chase their dreams, pursuing their real passions, making a difference in the lives of others — and leaving me so very inspired, and thankful to surround myself with such an ambitious and authentic group of people who follow their heart and don’t settle. This is what I aspire to do with my triathlon dreams. I am grateful that I’ve gotten to spend so much quality time with so many important people in my life during this off-season, and do some work on my well-being as a whole. It’s always good to keep things balanced, and the off-season can do wonders to help bring that equilibrium back. As far as training (yes, there has still been training)… After a couple weeks of solid rest (minus the occasional social spin or fun run with friends) I was eager to get moving again by the end of November. But while training resumed, for the next few weeks I maintained very little structure, really just doing what I “felt like” and making room for some different activities that I don’t always have time for during season. If it was a nice day and I was feeling good, I ran/biked/skied longer than anticipated, taking advantage of not having to stick to a plan. If I woke up feeling especially strong, I went hard. If I felt tired or was pressed for time, I went slow or kept it short. And if I just didn’t feel like training, I skipped it. I trained with friends, chatting as much as possible, forgetting about my pace or heart rate, and just enjoying being outside, taking in the fresh air and doing what I love. Thanks to some early-ish snowfall, I got in some great Nordic ski sessions that were super enjoyable, and started to feel really good on the snow. I’d also begun coaching my high school Nordic team, which is about as fun as it gets, hanging with some of the most amazing kids in the world. My step-dad, Dan, and I having some fun on the bikes. Happy to be back with my TEAM! Me and my Nordic girls! Haley and Zoe are SO excited for their first ski of the year! Levi enjoying a beautiful day to ride. Adventure day with the Nordic kids. Before I knew it, it was mid-December, and time to kick things up and get some structure and specificity back in my training. Since then, I’ve focused on building up my base for the season ahead, keeping my goals fresh in mind and concentrating on the specific things I need to be doing now to work toward achieving them. One of the big things for me has been focusing on my weakness: swimming. 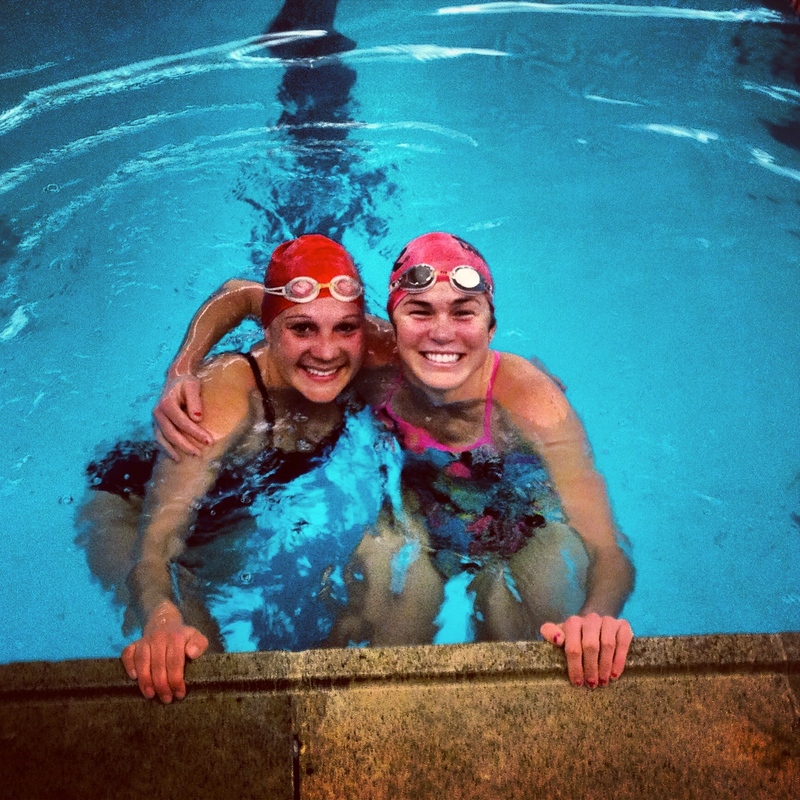 After my six-week swim hiatus following Maui, I was so grateful to have my good friend Lindsay (who I grew up on the swim team with) back in town to get my swim program kick-started again. She swam several times a week with me during her winter break from her MPH program (one of those inspirational rockstar friends! ), and we got in some of the most quality swim workouts I’ve had since I was swimming with my team back in high school. I felt more motivated in the pool than I have since beginning triathlon, and really started to make some big improvement.! It’s been much less fun since Lindsay went back to school, but thanks to all her help getting me into the swimming groove, I’ve been keeping up with it pretty well and am psyched about the progress I’ve made. I know I need to make big gains with my swimming in stepping up to the pro field this year, and I certainly hope this new commitment to quality time in the pool will help. 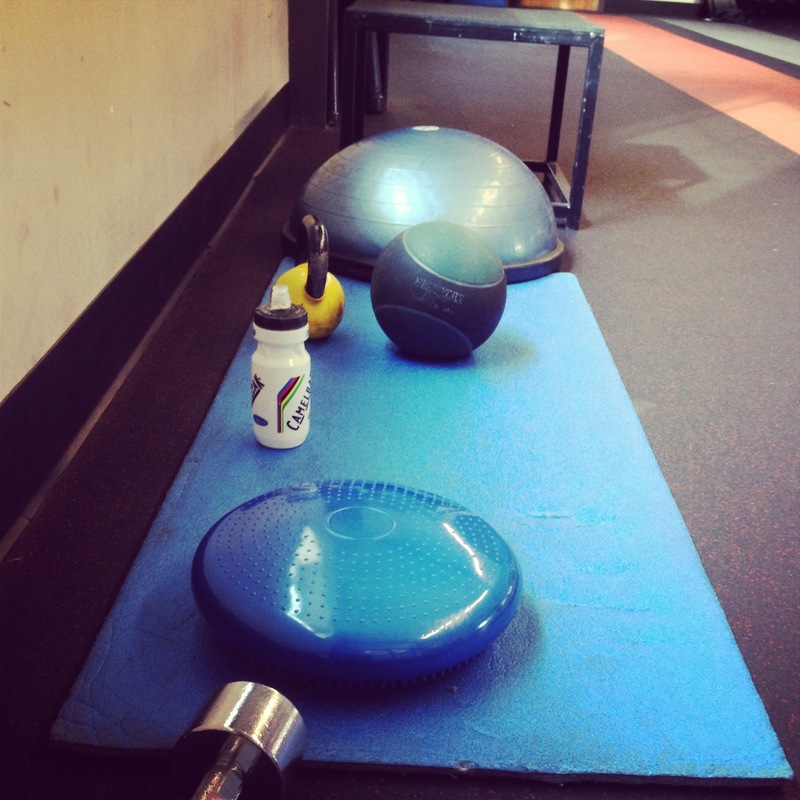 Another big focus of mine during this building phase, as it was last year, is strength training. This is the perfect time to put in some hard work at the gym, and I’ve been doing just that. Gym workouts have never been my favorite, but as I’ve invested myself more and more into gaining quality strength that will carry over to triathlon, I’ve come to really look forward to strength training several times a week. It’s really cool to see measurable progress, and feel yourself getting stronger. My hope is that this increase in strength will not only transfer to more stamina and better results, but also a healthier body that is less susceptible to injuries this season. Unfortunately, I’ve also been confronted this off-season with the realization of just how far off my knee still is from being back to 100 percent. While I was able to get away with a lot last season by just pushing through in order to race, now that I’m working on regaining leg strength again (which was too painful to do during season), it is clear that I still have a long way to go to be fully recovered and to get my left leg caught up with my right in terms of strength and power. But the good news is I’ve still got some time, and I’m making it a priority right now to focus on physical therapy and get my knee as close to full-strength as I can before season begins. Other than that, I’ve been enjoying some longer base mileage on the bike, running and skiing. We’ve had a super crazy winter so far here in Truckee, and thanks to a major drought, I’ve gotten in some awesome mountain biking and even some road biking this past month, which I normally never get to do at this time of year. Selfishly, I’ve loved being on my bike so late into winter and getting to avoid the trainer. The riding has been SO fun, and I’ve even gotten a head start on the season with a mountain bike race in January, and one more coming up next weekend. But the lack of snow has turned into a pretty dire situation here in the Sierras, and it’s been really hard to coach the team and be without skiing (save for one 2.5-kilometer loop that I’ve repeated more times than I care to recall this year). Ironically, I feel like I’ve rediscovered my love for skiing this year in a way I haven’t felt for some time, so it’d sure be nice to get some more snow and do a bit more skiing before triathlon season arrives. That being said, I have gotten to do some racing on my skis this winter, with success that has surprised me, and it’s been very fun — but SO tough! I nearly manage to forget just how hard ski racing is every year until I take a stab it again. But I’m happy it is still a part of my life, and a great training tool in the off-season that provides a challenge unlike any other. Perfect mid-winter trails in Reno. Mountain biking on Christmas Eve… a first! My kids making the best of our sad, sad snow situation. All smiles one a beautiful day for bike racing in June-uary. Four vizslas are better than one! A rare mid-winter mountain bike ride in Truckee. Mid-winter mountain bike racing is awesome! LUNA pro team member Teal Stetson Lee is back on the bike!